Here you will find information concerning our congregation and its ministries. We hope you find your time spent here a blessing. Our congregation is a warm and loving church, and we want you to feel comfortable and at liberty to call on us for all your spiritual needs. Feel free to browse through the various areas of our website and learn about our fellowship. If you are considering a new place of worship or a relocation to our area, we would love to have you come and visit with us. 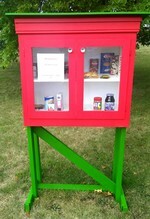 Our Blessing Box has been a great success and is being used daily. It is important that we keep the pantry stocked so we can continue to fill it. Remember the items that are mentioned in the weekly bulletin. However, we are not limited to those items if you want to do more. Thank you for your participation in this outreach.